Fracking firms have had much to celebrate over the last year, as the Trump administration and Republicans in Congress have moved swiftly to approve pipeline projects, roll back environmental regulations, and expand drilling access on public lands. It may come as no surprise, then, that the fracking lobby is the latest industry to return the favor by spending thousands of dollars at a Trump family property. The Independent Petroleum Association of America will hold its 2018 “Congressional Call-Up” lobbying event at the Trump International Hotel in Washington, D.C. from March 5 to 7. The agenda, which is publicly available, includes a meeting with officials in Congress and the Environmental Protection Agency, as well as meetings for conference attendees that will take place at the hotel. The IPAA Call-Up is an annual oil and gas industry lobbying event principally focused on influencing federal officials. 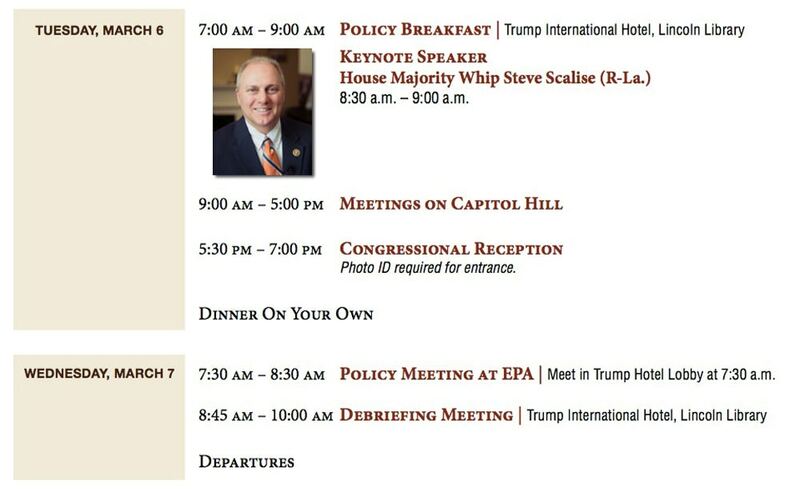 As is typical with these types of events, the lobbyists will spend an entire day in meetings on Capitol Hill, starting with a policy breakfast with House Majority Whip Steve Scalise, R-La., and a congressional reception later that day. The lobbyists’ meeting at the EPA will take place on the morning of March 7. No details have yet been provided on who from the EPA will attend the meeting. The EPA did not respond to a request for comment. The association represents Anadarko, Marathon Oil, Devon Energy, Noble Energy, Pioneer Natural Resources, and PDC Energy, among others. As of mid-January, booking a hotel room for the days of the event through the IPAA’s website comes with a price tag of $315 per night, almost half the cost of booking a room without the IPAA’s group code. The association will also be using meeting rooms at the hotel during the three-day event. The IPAA did not respond to a request for comment. The IPAA has long lobbied aggressively to approve the Dakota Access pipeline, the infrastructure project designed to lower the costs associated with fracking the Bakken oil fields in North Dakota. In February 2017, following months of protests by environmental activists, the Trump administration moved to greenlight the pipeline. In its first six months of operation, the pipeline experienced five spills. The association was a fierce critic of the Obama administration’s Methane and Waste Prevention rule, a regulation to discourage methane waste, a significant greenhouse gas, at fracking sites. Here, again, the Trump administration has sided with industry to suspend the rule, though environmentalists have challenged the decision in court. The IPAA has also cheered a series of decisions by the Trump administration to open up public lands to expanded drilling. IPAA public disclosures reveal lobbying on more than two dozen other congressional and agency decisions that could boost the bottom line of frackers, from decisions over oil and gas royalties to an effort to expedite liquified natural gas terminals. Some of the measures, including H.J.Res.41, a congressional resolution to repeal an Obama-era rule from requiring fossil fuel firms to reveal payments to foreign governments, sailed through both chambers and were signed into law. The Trump International Hotel, which opened in September 2016, is reportedly among the most expensive venues in Washington, D.C. Still, the Trump family property has become a frequent convening point for many industry groups in the year since Donald Trump took office. As The Intercept previously reported, coal executives and mining lobbyists with the National Mining Association, a group that has particular influence over Trump administration officials, chose the hotel for a lavish convention last October. After our story, Interior Department Secretary Ryan Zinke dropped from the agenda — although other cabinet secretaries still attended the event. The American Legislative Exchange Council, an industry-backed group that promotes industry-friendly “model” legislation, plans to hold its 45th anniversary fundraising gala at the Trump International Hotel on September 26, 2018. ALEC is seeking corporate sponsorships of up to $100,000 for the event. Lobbyists for foreign governments and others seeking to shape administration policy have spent thousands of dollars to book rooms, parties, and special events at the D.C. hotel, according to a new report from Public Citizens. The group found that officials from the governments of Saudi Arabia, Malaysia, and Kuwait have used Trump-owned hotels since his election victory. Critics with concerns about the president’s potential conflicts of interest are increasingly scrutinizing events at the hotel, since Trump and his family personally maintain ownership of the property.